Here is a list of Best Free Catia Viewer Software For Windows. These free software let you open and view Catia files of different generations, such as: Catia 4, Catia 5, and Catia 6. These Catia files include 3D formats, like: 3DXML, CATPart, .model, and .exp files. You will find out the formats these free Catia viewers support as you go through the list. The tools that these freeware have to offer let you view Catia files minutely and examine them. All the required tools to view Catia files are available here. You will find tools to Rotate, Zoom, Pan, Move, Spin, and view a 3D model from different angles. Catia models can be viewed in various projects as well, such as: Isometric, Top, Bottom, Front, Back, Right, Left, or Isometric. In order to view Catia files’ structure, you can choose solid mode, solid mode with edges, or with wireframe structure. Most of these software let you view multiple Catia file formats, while one of these Catia viewers is a dedicated free 3DXML viewer which only lets you view Catia 6 files. Go through the list to find out more about these free Catia file viewer software and also get to know how to open Catia files with these free Catia viewer software. I like eDrawings the most as a Catia viewer software because it lets you easily load Catia files and view them. It lets you view 3DXML files and view CATPart files as well. The best part about this Catia viewer is that its tools are easy to operate and function very smoothly. You can also checkout the list of best free SLDPRT Viewer Software, JT Viewer Software, and CAD Viewer Software for Windows. eDrawings lets you view Catia files, along with various other 3D CAD files. You can view both Catia V5 and Catia V6 files, that are CATPart and 3DXML files respectively. This Catia Viewer has a vast set of viewing tools that can help you inspect a 3D model. General 3D viewing tools, such as Pan, Rotate, Zoom, and Perspective control are available right on the workspace. A model can be viewed in various orientations, such as: Top, Back, Front, Bottom, Left, Right, and Isometric. Wireframe structure or a model with shaded structure can be viewed pretty easily. An animation tool is available in this Catia viewer, which animates the model transition between different orientations of the model. The Section tool is a very useful tool that you will find here. It lets you view cross sectional structure of a 3D model in XY, YZ, or XZ planes. eDrawings provides options to Markup and Measure, but these tools do not work when you have Catia files opened here. All in all, its a feature rich Catia file viewer software, where you can easily view Catia V6 and Catia V5 files. 3D XML Player is a very simple 3DXML viewer for Windows. 3DXML files are Catia 6 files and contain 3D models. This freeware to open Catia files have enough tools to let you easily view a 3D model and inspect it closely. Just like other Catia file viewers, it has tools to rotate, zoom, pan, move, and spin a 3D model. Various projection modes to take a look at model from its left, right, top, bottom, and isometric views are available. You can choose from various background options, and can also view a model in Wireframe, solid, and solid with edges modes. Component tree of a model can also be viewed here. 3D XML Player lets you print 3DXML files directly from its interface. As I said, its a very simple viewer, and you will not find options here, other than the viewing tools I mentioned. EnSuite-View is a very good free Catia viewer, where you can view Catia 6 files, Catia 5 files, and Catia 4 files for free. This software is a free version and comes with certain limitations. The limitations do not apply to the viewing tools, but applies to the number of files one can open here. For the free version, you can only view 6 CAD files per month. You will have to sign in to the application first, before you can open Catia files here. Lets get to know about the viewing tools it has to offer. Standard tools to move, pan, rotate, spin, and zoom are available. Also, various projection modes can be set to view 3D files, such as: Right, Left, Top, Bottom, Front, Bottom, and Isometric. 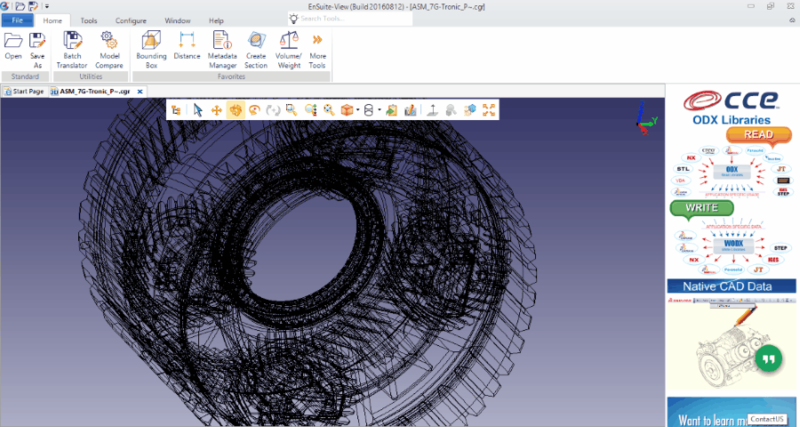 You can view wireframe structure of a Catia file with or without the hidden parts grayed out or invisible. Measurement tools and tools to measure weight and volume are available, but these tools do not work with Catia files. If you want, you can view the structure tree of a 3D model and hide certain parts. Print a Catia file from here, and you can also convert Catia files to DWF, STL, CGR, or PDF. NuGraph from Okino CAD provides a free demo version to view CAD files. This software also lets you open and view Catia files, but in order to do so, you will have to install an additional plugin. The download link to plugin is available on the download page of this software. NuGraph can only open Catia 5 and Catia 4 files. To view Catia files, you will have to Import them to this CAD viewer. 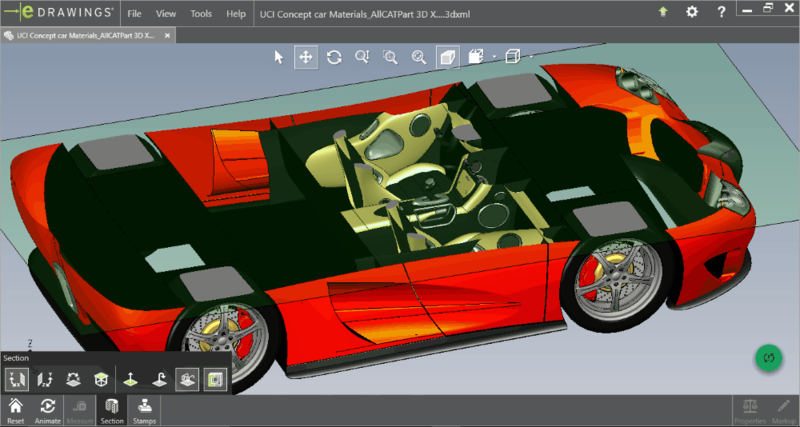 Once a file is loaded, you can use various viewing options to examine your Catia model. Easily Rotate, Zoom, Pan, Move, and view Catia files in different camera views. Different projections of a model, like: Top, Right, Front, and Isometric can be viewed. A Multi-window preview option lets you take a look at different projections of a model at the same time. Using NuGraph, you can convert Catia files to DWG, IGES, Sketchup, STL, and other CAD formats, but as this is a demo version, it does not exports every 5th polygon of the 3D model being exported. The same restriction applies while viewing a 3D model, as you can see that few polygons are missing in the above model. This free Catia viewer is only recommended if you just want to quickly view CATPart files, .model files, or .exp files.